For almost a century, Milwaukee has been one of the leading manufacturers of power tools on this side of the water. Their flagship power tools are some of the best in existence, which is no wonder when we take the company’s dedication and effort into consideration. Their 2787-22 model is the priciest machine of this type we’ve had the opportunity to test so far – it’s an expensive magnetic drill known as “every contractor’s dream” that packs a powerful punch and comes equipped with a plethora of handy features. But is it actually worth all that money? To find an answer to that question, we gave this unit a thorough examination and carefully analyzed its design and power. Those interested in buying an all-around cordless magnetic drill that will serve them for years to come should keep on reading – Milwaukee 2787-22 might be what you’re looking for. As you already know, drilling holes in metal objects can be quite tricky. Fortunately, the Milwaukee 2787-22 is the right tool for this job – it’s a powerful magnetic drill that makes short work of any task you throw at it. The unit has a magnetic base that the user can attach to the workpiece and then activate the magnet, which will secure the unit and allow drilling. This base is powered by a permanent magnet, providing enough force for heavy-duty projects. Other characteristics worth mentioning are the 2-speed gearbox (400/690 RPM), a lubricant/coolant that prevents the heat from building up, a quick-change chuck, the integrated LED light, as well as the Auto-Stop lift-off detection. Just like all other Milwaukee tools, the 2787-22 magnetic drill also sports a beautiful red & black look. Due to the price category that it’s in, the unit has the best possible construction quality – it is as durable and reliable as it gets. As previously mentioned, the first thing to notice about this unit is its base, which is, actually, a permanent magnet that’s not powered by the M18 batteries. The fact that it provides 2,000lbs of holding force makes it more than suitable for all kinds of projects, no matter how large and tough they are. The base is activated via the knob on the machine’s back. With the dimensions of 7.2″ x 21.9″ x 29.1″ and the weight of below 30 pounds, 2787-22 is a very portable drill – moving it from one job site to another is a breeze. We were pleased to see that Milwaukee decided to equip this drill with a LED light, which provides illumination in dimly-lit or dark areas. 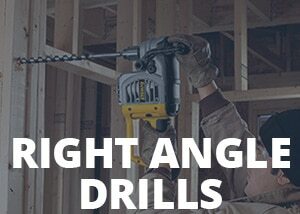 Due to the fact that this drill allows the use of both standard and annular twist bits, it provides the user with the ability to adjust the speed to the task at hand. This is made possible by the presence of a 2-speed gearbox that enables one to change the speed from 400 to 690 RPM (rotations per minute). And no matter which speed you choose, you won’t have to worry about overheating – that’s what the integrated lubricant/coolant is there for. Another great feature is the included quick-change chuck. It comes with a 3/4″ Weldon adapter that allows quick swapping between annular and shank drill bits. The fact that the engine is brushless gives the whole device a longer lifespan, while the manufacturer’s signature REDLINK intelligence system protects the unit from overloading and provides optimized performance. Pretty impressive, wouldn’t you say? Along with the drill itself, the package also includes a chuck key, a safety strap, a magnetic lubrication tank, and a sturdy carrying case. There’s a 5-year warranty on this tool, which is very impressive, although it’s something we’re used to when it comes to Milwaukee products. As you can see from above, the Milwaukee 2787-22 is one of the best magnetic drills that money can buy today. The clever design of its magnetic base allows drilling in all positions – even upside down. Furthermore, the unit has enough power to replace even the corded magnetic drills, as it can drill more than 40 holes on a single charge. The 2-speed gearbox is yet another advantage and something that makes the model even more versatile. Other things we liked are the high-quality construction, the lubricant/coolant, the Auto-Stop lift-off detection (for when the material is too thin), the LED light, the ability to quickly change the drill bits, as well as the inclusion of a nice carrying case for the drill and its accessories. The only thing that could prevent this model from becoming immensely popular is, of course, its price tag. As we said, the Milwaukee 2787-22 is the most expensive magnetic drill we’ve reviewed so far, since it sports a build quality that puts it far above the competition. Those on tighter budgets will have to look elsewhere, and that’s a shame when we consider how great this machine is. As expected, the Milwaukee 2787-22 was very well-received by the users, who are praising every single feature of this fantastic magnetic drill. They are especially praising the model’s unmatched efficiency, saying that they’ve never owned a drill that makes such clean holes so quickly. They’re also quite pleased with the unit’s magnetic base and its unbeatable holding force, as well as with the 5-year warranty that assures them that the machine won’t need maintenance any time soon. In our opinion, the Milwaukee 2787-22 definitely makes up for that extra cost with its efficiency, safety, great design, and the quality of work that it leaves behind. To put it simply, it’s the best magnetic drill that money can buy today – reaching deep into your pocket is not something you’ll regret here.